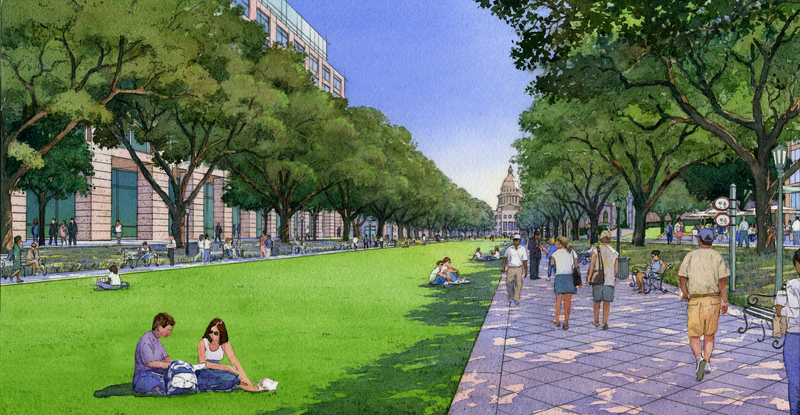 The 2016 Texas Capitol Complex Master Plan reimagines the Capitol Complex as a destination that celebrates the Capitol and centralizes all state agencies. Characterized by grand civic spaces, shaded pedestrian-friendly streets, and connections to the surrounding community, the first phase of the master plan includes two new office buildings and five levels of underground parking, which will be the base of a new, pedestrian-oriented Texas Mall. This tree-lined promenade will be located on Congress Avenue between 16th Street and Martin Luther King Jr. Boulevard, and will serve as the northern gateway to the Capitol Complex with public green space for tourism, events, and festivals. Phase One of the 2016 Texas Capitol Complex Master Plan includes the construction of two new office buildings that will allow the consolidation of staff currently working in leased space. Consolidating staff has the potential to create operational efficiencies between and within agencies, provide visitors easier access to agency offices, and eliminate the cost of leased space for these offices. Find the Pre-Concept Report on the Texas Facilities Commission website. View the entire 2016 Texas Capitol Complex Master Plan on the Texas Facilities Commission website. Find detailed information on the procurement process on the Texas Facilities Commission website.